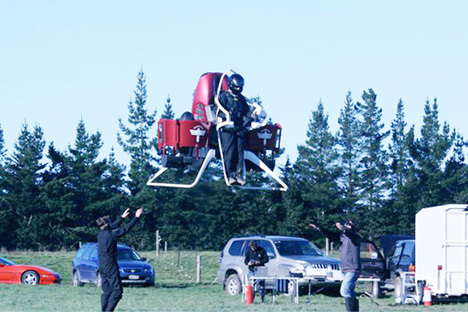 When New Zealand’s Martin Aircraft Company announced plans for a “practical jetpack,” this oxymoron of a device no doubt raised a few eyebrows. Originally slated for a mid-2014 commercial release, it’s been retooled and the company hopes it will be available for consumers by 2015. If the above picture is any indication, cult leaders will find it perfect for an escape hover just above the heads of their demystified followers. 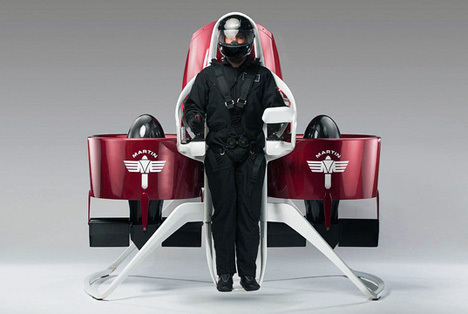 The Martin Jetpack’s initial applications will be in first responder-type scenarios like fire and rescue. On a full tank, the gasoline-powered beast can remain in the air for around 30 minutes and travel about 20 miles at up to 46 MPH. The company most recently improved the handling on its P12 prototype by re-positioning the craft’s ducts. 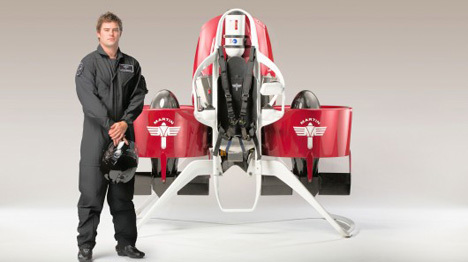 For ideal performance and safety, Martin suggests the jetpack be piloted above 500 feet, mainly to give its rocket-deployed ballistic parachute time to open. It will also require the user to wear a helmet, neck restraint, boots, a fireproof suit and hearing protection. By the time it reaches the US market, it is expected to carry a relatively-modest $100,000 price tag. See more in Concept Vehicles or under Transportation. December, 2013.